Historical landmark. Third Chamber of Parliament. Home to a nation's secrets. Yes, ladies and gentlemen, we’re building the Fairmont Chateau Laurier, in miniature. From the moment that David, our Draughtsman of Delicate Dwellings, started designing our Ottawa destination, he knew that the Chateau Laurier was going to be a goldmine of miniature architecture and scandalous stories. So Dave and our build team are creating an up-close-and-personal experience for our guests. In our miniature version, Dave has cut away an outside wall, so you’ll be able to explore every nook and cranny of this famous building, inside and out. To build this intricate model, Dave first made a tiny model of the model, then a cardboard mock-up of the model, which you see here. 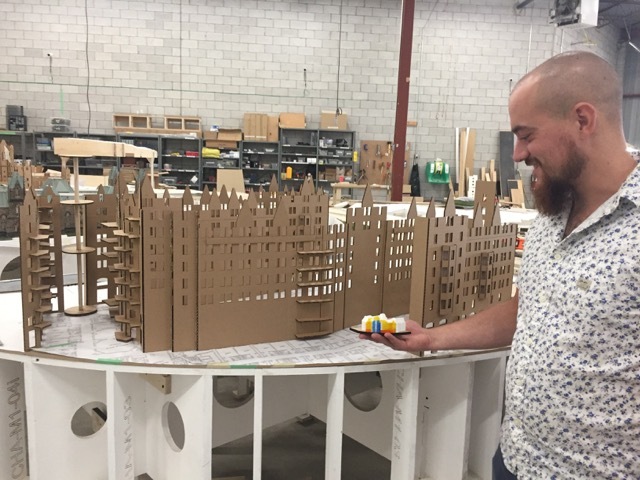 Be sure to check back in to watch the team build our miniature Chateau Laurier on the edge of our Rideau Canal. We have the inside scoop on the stories of the most distinguished and notorious guests of the Chateau, thanks to Kevin Holland, author of “Chateau Laurier - A Splendid Century: The Life and Times of Ottawa’s Grand Railway Hotel. So we’re going to build some the best of those stories into a journey through the luxurious lobby, up the grand spiral staircases and working elevators, down to the great dining hall and grand ballroom, and into some of the 429 hotel rooms. Special thanks to Kevin for his lending his expertise to us.